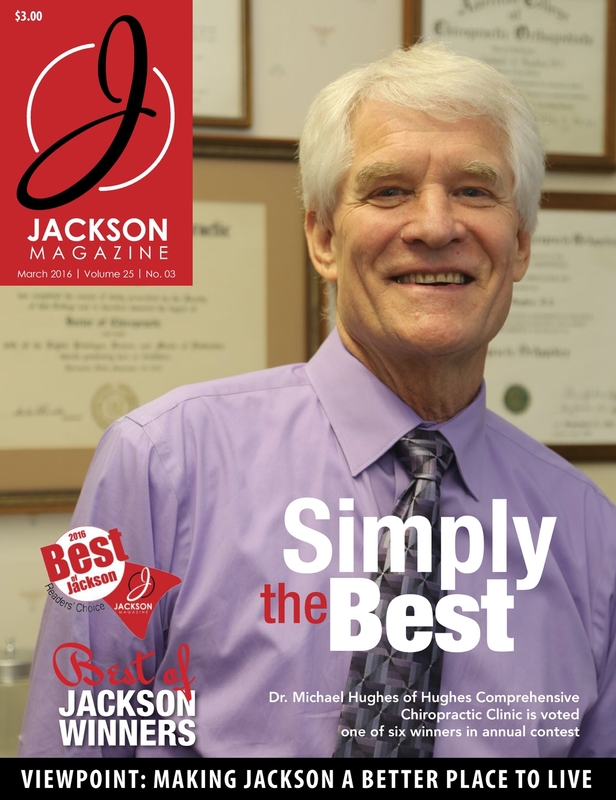 Looking for a past issue of Jackson Magazine? You’ll find it right here. We archive issues from the past three years. To read a previous issue in its entirety, simply click the link of the issue you want. 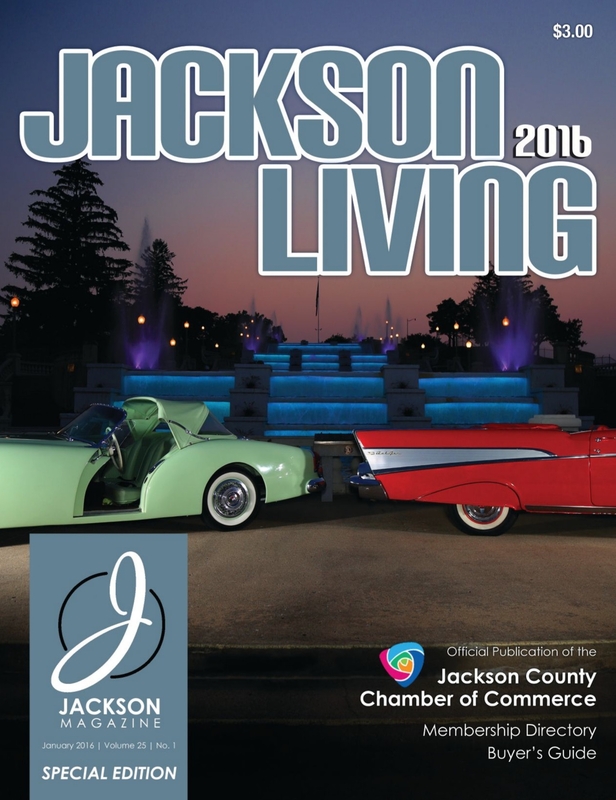 Now available is the 2016 Jackson Living issue, the annual official publication of the Jackson County Chamber of Commerce. The full-color guide includes a membership directory of all Chamber members, as well as a Buyer’s Guide, listed by business type. Check it out today! This month we take a look at people and places that shape the culture of Jackson. 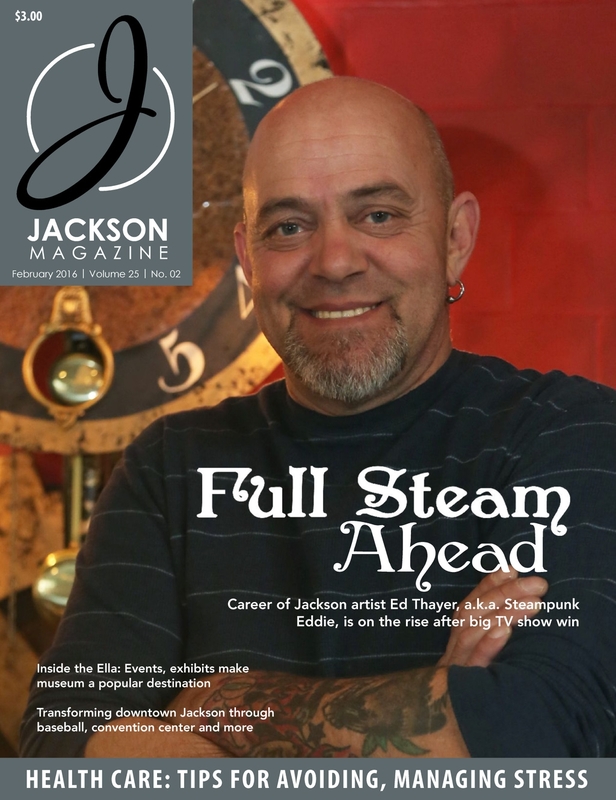 Our cover story features Steampunk Eddie, the local artist who has made a name for himself both here in Jackson as well as nationwide. In addition, we highlight the exhibits and events that Ella Sharp Museum offers to the community, and we look at the big plans visionaries have for downtown. Read it here now! The votes have been tallied, and we have all six winners of this year’s Best of Jackson. We received more than 13,000 votes in this year’s contest, which featured a new, two-part format. Readers chose their favorite businesses in six categories, including Best Chiropractor, Best Diner, Best Place to Buy Unique Gifts, and more. In addition to featuring the winners, we also highlight the remaining two finalists in each category. Read it online now! This month, we look at companies in the health-care field that are growing and/or expanding. 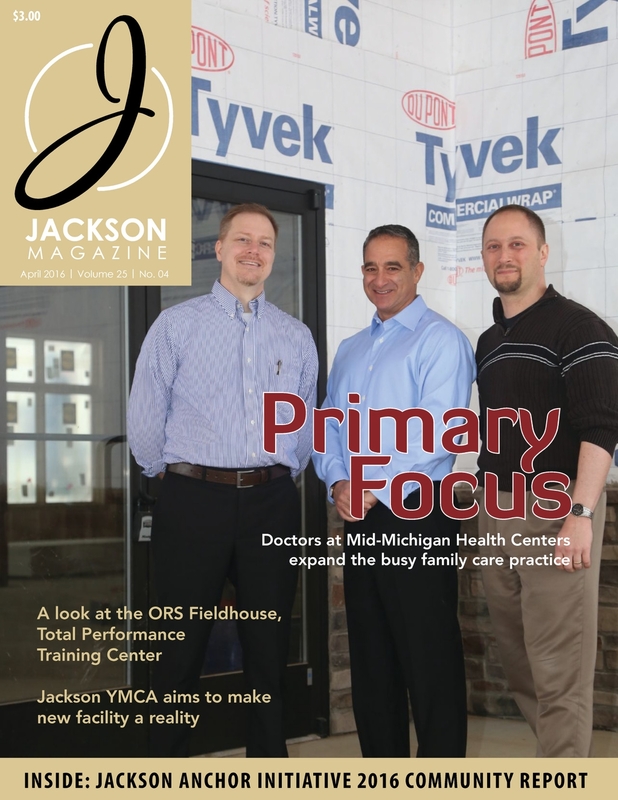 On the cover is Mid-Michigan Health Centers; the three doctors are expanding the busy family care practice by an additional 3,000 square feet. We also look at the ORS Fieldhouse and Total Performance Training Center, the latest project from Orthopaedic Rehab Specialists, as well as the quest of the Jackson YMCA for a new facility. Also inside as a pull-out: the Jackson Anchor Initiative 2016 Community Report. Read it today! 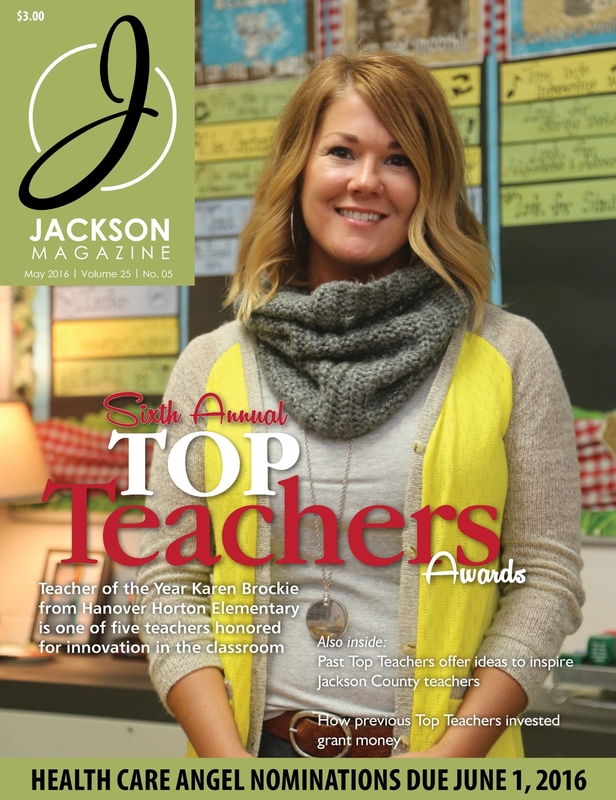 For the sixth year, Jackson Magazine has named the five Top Teachers of Jackson County. Karen Brockie from Hanover Horton Elementary is the Teacher of the Year, and she receives $5,000, thanks to a grant from the Jackson Community Foundation and the Hurst Foundation. The four Top Teachers receive $1,000 grants each, for classroom use and/or personal development. Read all about these five extraordinary teachers today! Real Estate is the theme for this issue, and we look at it from various perspectives. Our cover story looks at how companies have radically transformed and re-purposed old buildings. For instance, Richmond Brothers moved from its Napoleon location to a former airplane hangar at the Jackson County Airport. Consumers Energy recently unveiled its Innovation Center, and the Jackson Candy & Fudge Factory underwent a three-year-long renovation. Also inside, we look at companies that have boosted their visibility by moving to a new location, and we examine the state of the local real estate market. 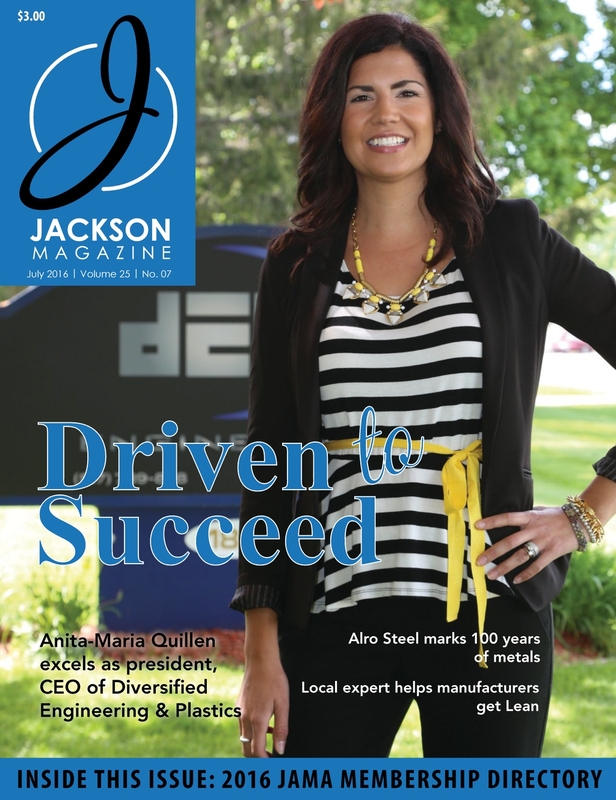 As it is every year, the July issue of Jackson Magazine is all about the local manufacturing industry. On our cover is Diversified Engineering & Plastics and its President & CEO, Anita-Maria Quillen. We also feature Alro Steel, which is celebrating 100 years of metals, as well as the Lean training available at the Jackson Area Career Center. 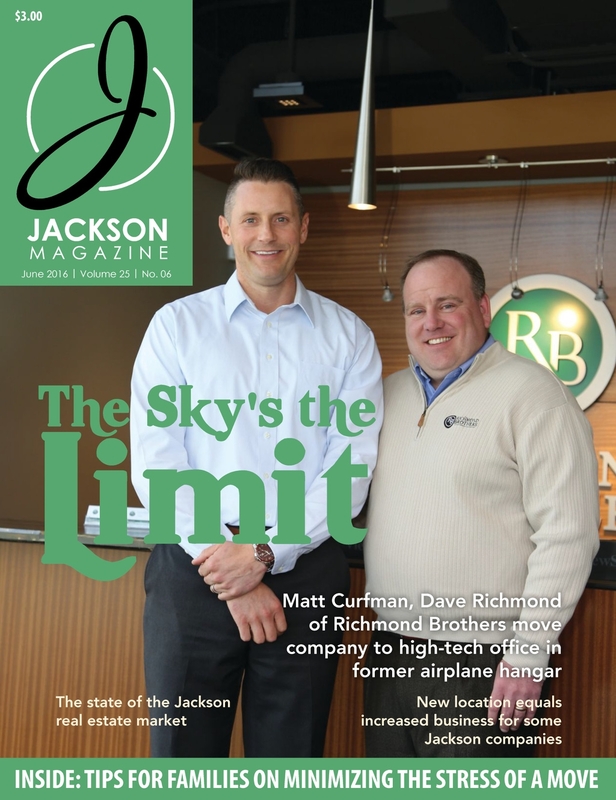 This issue also includes the Jackson Area Manufacturers Association Membership Directory. Read it online from cover to cover! This month we look at an always-popular topic – Food & Dining. 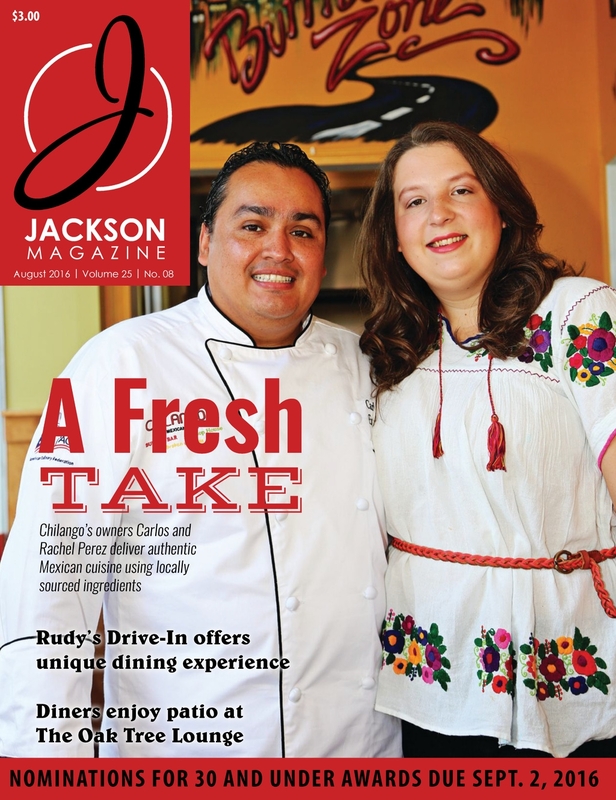 Featured on our cover are Carlos and Rachel Perez of Chilango’s; they own and operate four restaurants in the county, all featuring authentic Mexican cuisine. Also in this issue is a look at Rudy’s Drive-In, the only drive-in spot in Jackson. Always crowded during the summer, the restaurant brings burgers, fries, root beer and more right to your car. And we also spotlight the new, popular outdoor seating at The Oak Tree Lounge. Read it online today! 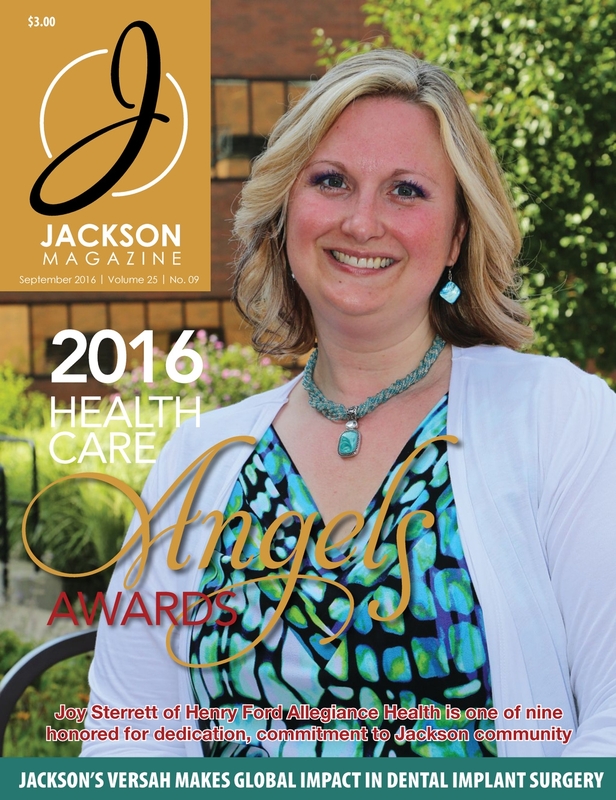 For the ninth year, Jackson Magazine is recognizing the shining stars in the local health care community. These awards honor people in all areas of the health care industry who go above and beyond their job description to care for their patients and the community as a whole. The awards include a special Legacy Award, honoring a man who has made a tremendous impact on senior care in Jackson. Read their stories online today! This month, we feature successful women in three different industries. On the cover is Michelle Moore, owner of Not So Shabby, Oh! So Chic, a growing business that also offers a variety of art classes. Inside you will read about Johnene Gaston, who realized her dream by opening Quality Life Hearing Center, and Dr. Meaghan Brent, who has successfully grown her chiropractic practice. Read it cover to cover online! 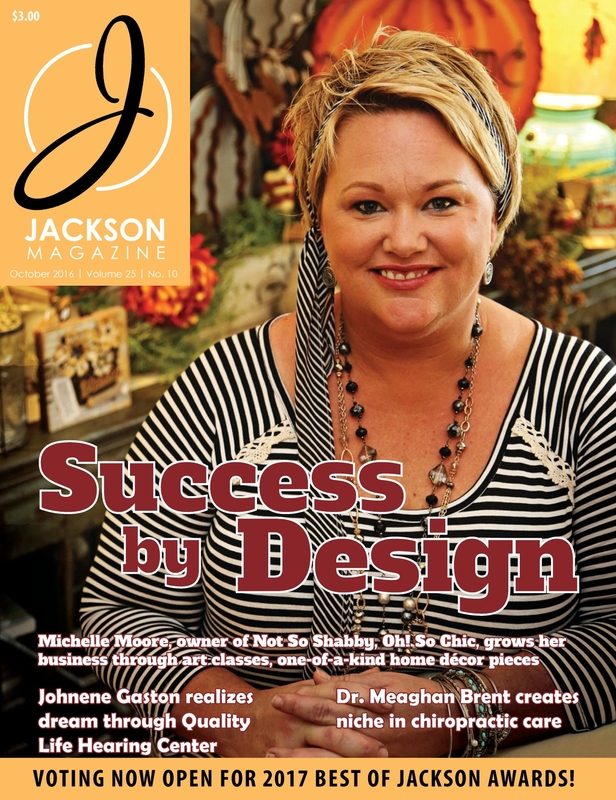 This month Jackson Magazine heads to downtown Jackson, looking at a variety of businesses. 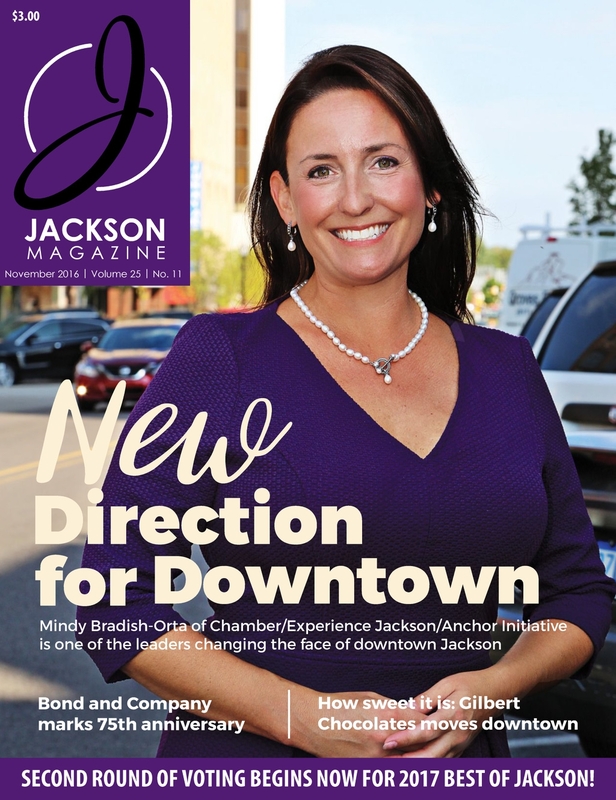 On the cover is Mindy Bradish-Orta, who helms three organizations – the Jackson County Chamber of Commerce, Experience Jackson, and the Anchor Initiative – and is one of the leaders changing the face of downtown. This issue also features Bond and Company, which has called downtown home for decades, and Gilbert Chocolates, which has moved its manufacturing facility and retail store downtown. 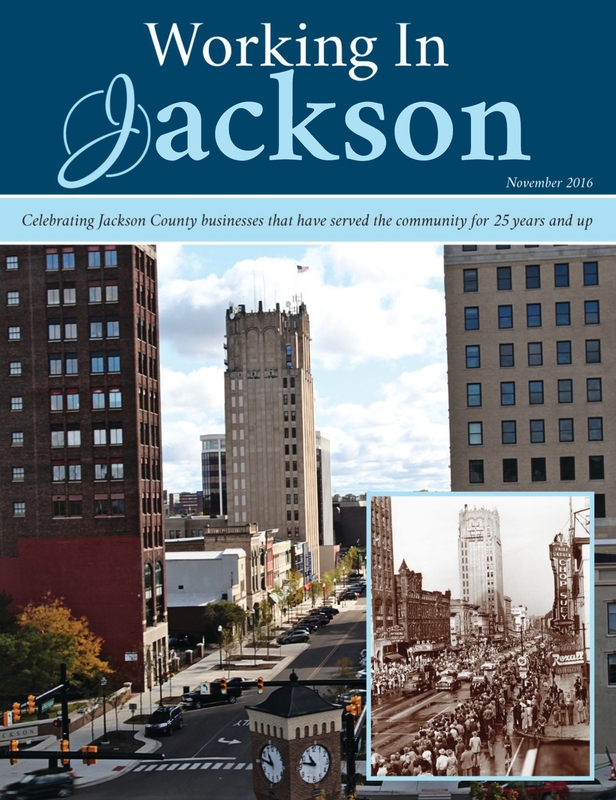 Bonus issue: Included in November is a special Working in Jackson issue, which highlights businesses 25 years and up. Read it online today! Meet the 30 and Under Class! 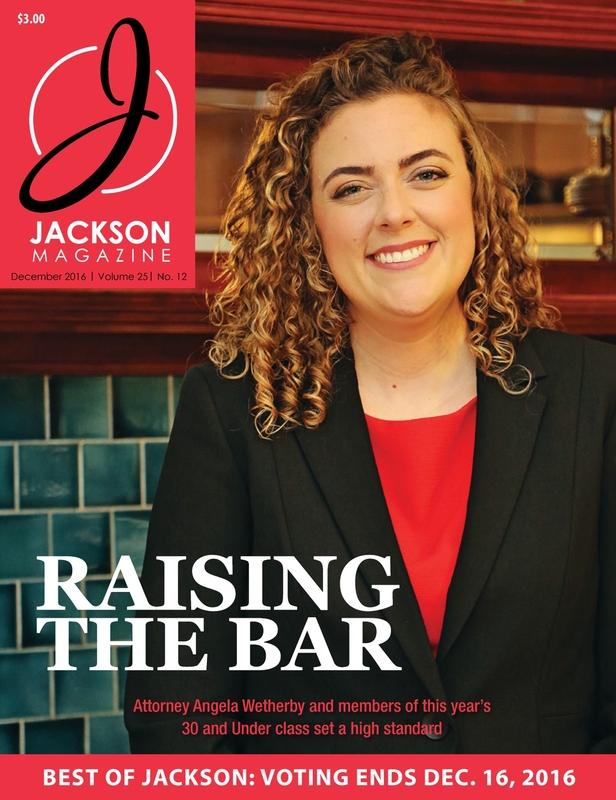 For the ninth year, we honor the top young professionals in Jackson County. Inside this issue you’ll meet the 12 honorees of the 2016 30 and Under class who are recognized for success on the job as well as their involvement in the community. Also, we look back at five members of the 30 and Under class from 2011 and see how their lives and careers have evolved in the past five years. Read it today!